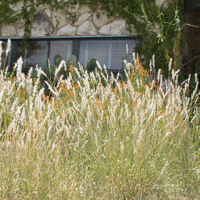 This warm season perennial grows up to 2 feet, with 3 to 4 inch silvery plume-like seed heads borne on taller stems. Thrives on rocky limestone slopes as well as heavier soil areas from Nebraska, Colorado and Missouri down to Mexico. 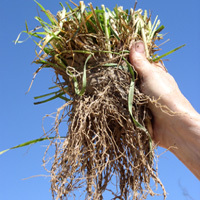 Fills in fast on disturbed and abandoned fields, holding and building soil by spreading fibrous roots. Grows where nothing else will! You'll receive roots that will make 10 to 15 plants or more. Plant roots as soon as you receive them. Then give a good deep watering for easy establishment. Order by 11am on Monday. We dig and ship roots every Tuesday with 1-2 days UPS delivery (out of state extra charges may apply). Please be ready to plant & water your roots A.S.A.P. after receipt of order. Our goal is to ship roots on Tuesdays but from time to time mother nature has her own plans. If your shipment of roots is time critical, please call to make special arrangements. If you also have seeds in your order that you want to be shipped sooner, please advise on comment section of your order. Additional shipping will be charged.